Consortium of PKP Energetyka S.A. and Atende Software Sp. z o.o. implements the Intelligent system of support and optimization project in the field of network assets management. The goal of the project is to develop and implement a prototype system supporting maintenance decision making in relation to the key infrastructure managed by PKP Energetyka S.A. The project is co-financed from European Funds. The value of the project will be 7 642 140.00 PLN, of which 4 352 241.94 PLN is financed from EU funds. From 13 to 18 September, Amsterdam held the most important trade fair for the media, entertainment and technology industry, bringing together over 1700 exhibitors and 57,000 visitors. Atende Software once again presented the redGalaxy - an OTT platform allowing content providers and carriers to develop their online presence. During this year's fair, redGalaxy had its booth in hall 14, which was described by the IBC Daily reporter Anne Morris as one of the most exciting and interesting spaces at IBC. This year, the latest features of the system were presented at the redGalaxy stand – in stream object recognition and dynamic ad insertion. This technology is based on AI allowing for countless applications, including advertising or e-commerce. According to S&P Global Market Intelligence, Poland is becoming top European market for OTT TV. The research found that 81% of internet users in Poland were watching streamed video on connected TV sets, comparing to 79% in the UK, and 74% in both Sweden and Germany. Such a big demand could not go unnoticed by the leading VOD players on the Polish market - Player.pl and PLAY NOW, who decided to expand their presence to new connected TV platforms. Both described above platforms are running on top of redGalaxy, a cloud OTT solution developed by Atende Software, which enables content providers and carriers to develop their online presence and monetize video. redGalaxy offers cutting edge content monetization features, like dynamic ad insertion and in-stream object detection. It consists of all in-house developed modules required to run your own Internet TV platform: CMS, CDN, transcoders, DRM systems, easily customizable portal and apps (Android, iOS, Android TV). redGalaxy’s Android TV app can be deployed in two scenarios - either as a regular app available in Google Play or on dedicated STBs (with custom launcher), allowing operators to customize the look and feel of the OS and position their content better. As of today, the source code of Phoenix-RTOS (real-time operating system) is available on GitHub . This is groundbreaking news for both small and large scale developers seeking an efficient, scalable and modular real-time operating system, tailored especially for next generation IoT software-defined solutions and resource-constrained devices. Phoenix-RTOS may be employed across a wide range of purposes, appliances, and markets - including mass production. 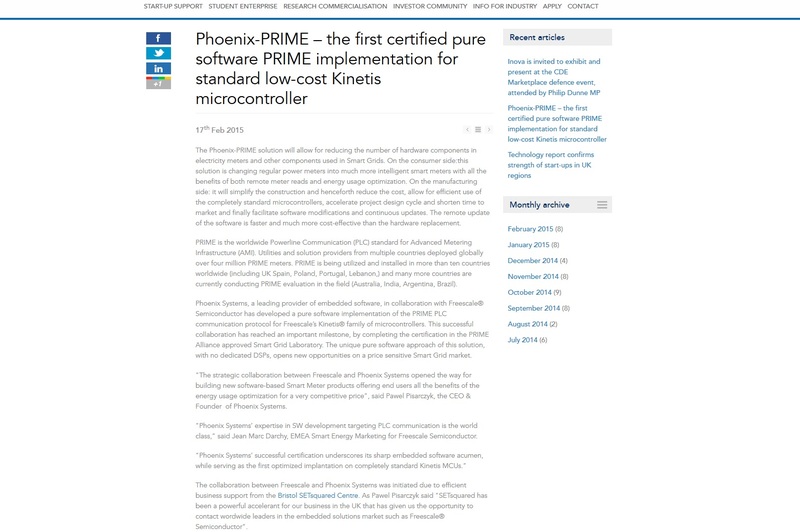 Phoenix-RTOS, one of the world's first real time operating systems for IoT, is based on microkernel architecture and benefits from almost 20 years of development. In contrast to most globally available real-time operating systems, Phoenix-RTOS allows for programming complex functionalities in even the smallest and simplest devices with very low power consumption and without a Memory Management Unit (MMU). 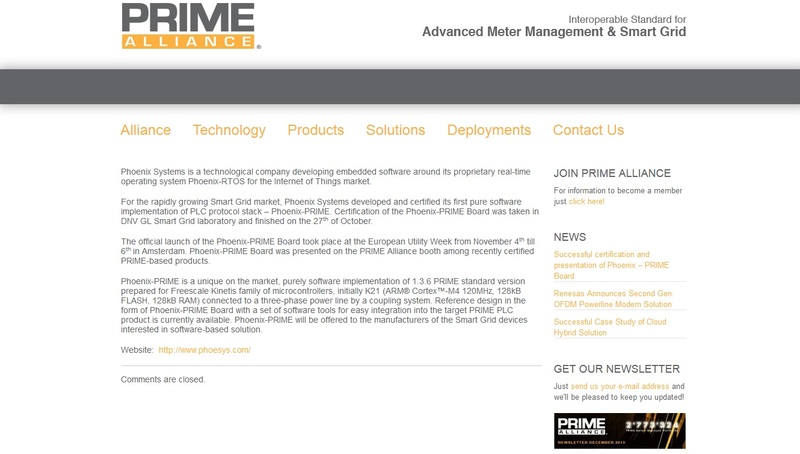 Phoenix-RTOS has already been deployed on a massive scale in Smart Grid devices (smart energy meters, data concentrators, smart gas meters) in Europe and Asia. It is the operating system of choice for developers working on IoT devices in sectors such as: electromobility, smart home, smart city, wearables, e-medicine, robotics, aviation or telecommunications. Phoenix-RTOS has been made available under the BSD license, which focuses on user rights and allows for source code modifications. The founders look forward to building a community around Phoenix-RTOS, giving its members the possibility to test, modify, develop and quickly adapt the system to specific purposes. Phoenix-RTOS is an orderly designed and compact code, created to allow designers to get ahead of current methods in IoT design. We strongly believe that by opening the source code, we give designers all over the world the unprecedented opportunity to facilitate not only the design process, but also time-to-market implementation of IoT devices that are ahead of our time” - says Pawel Pisarczyk, Phoenix Systems CEO & Phoenix-RTOS author. Atende Software, a provider of comprehensive technological solutions for Internet television, has deployed its CDN infrastructure in the London-based Internet exchange point. Now viewers in the UK and Western Europe will enjoy higher video quality, and new customers will benefit from platform available in PaaS model. redGalaxy is a comprehensive over-the-top (OTT) platform which enables content providers and carriers to develop their online presence and monetize video, in addition to traditional media distribution channels. redGalaxy consists of all in-house developed modules required to run your own Internet TV platform: apps, portal, CMS, CDN, transcoders, DRM systems and can be offered in both PaaS and on-premise deployment models. Thanks to its presence in the London Internet Exchange (LINX), the company’s Western European customers are able to use the redGalaxy media distribution platform in the PaaS model, i.e. without the need to invest in and maintain hardware, and their existing customers will enjoy better video quality. "Thanks to LINX presence, our CDN capacity increased by 100 Gbps" says Przemysław Frasunek, Multimedia & Security Division Director at Atende Software. "redGalaxy gives an opportunity to monetize existing content in new ways, including server-side dynamic ad insertion and in-stream image recognition" says Frasunek. Atende Software is a leading provider of Internet television technology and cybersecurity solutions to the largest broadcasters and carriers in Poland, including TVN S.A. (subsidiary of Discovery, Inc.), P4 sp. z o.o. (the largest MNO in Poland), Polkomtel sp. z o.o. (second largest MNO in Poland), and Vectra S.A. (second largest CATV in Poland). Following more than 10 years of steady growth in the domestic market, the company is expanding into international markets. The London Internet Exchange (LINX) is one of the world's largest Internet exchange points (IXPs), connecting over 770 service providers from 76 different countries. LINX handles traffic of over 3.85 terabits per second and 20.8 Tbps of connected capacity. Atende Software's infrastructure at LINX will have a capacity of 100 gigabits per second, which is a considerable increase over its existing telecom resources. Pawel Pisarczyk, president of Atende Software and Phoenix Systems, took part in a three-day Polish-American scientific and technical symposium at Stanford University, entitled Internet of Things, Poland Day in Silicon Valley. The aim of the symposium is to connect the American and Polish business community and support the development of scientific, engineering and economic cooperation between countries. The main topic of this year's symposium are the opportunities and challenges of the Internet of Things. "Polish companies can play a significant role in the development of IoT. We are famous from having very good engineers. We can create integrated circuits, very advanced software - even operating systems, but our biggest problem is global thinking. We are not able to scale our solutions to the whole world and we need help here, because IoT is a business that relies on a large scale and is not local - said Pawel Pisarczyk during his speech in the panel discussion. The Symposium does not focus only on the Internet of Things, but also on the IoT's environment - cloud computing, cybersecurity, cryptocurrencies, smart cities, transport and energy. The participants jointly reflect on the development and use of these technologies on the Polish and American market. Once again, the redGalaxy platform will be present at the fair in London. redGalaxy is a comprehensive OTT platform developed for years, offered by Atende Software. The product consists of all modules necessary to run your own internet television: distribution system, content storage, transcoder, multimedia content management system, WWW portal and client applications. This year, the system will be presented at the x-dream partner's stand, from February 27 to March 1 at ExCel London, at booth S1-8E16. BVE is a show bringing together over 300 companies from Europe that influence the world of entertainment and the media by their technologies. Currently, TVN Group is one of the most important clients of the redGalaxy platform. The player.pl service, as well as the other TVN portals since 2011, use redGalaxy for the entire process of processing and publishing multimedia content. Starting from 2017, the player.pl portal and mobile applications for Android and iOS are based on redGalaxy products. In 2018, the redGalaxy technology has a chance for the first international implementation. Conversations with content providers are ongoing.